Judith Josephson loves to dig into the past and is fascinated by people's lives. 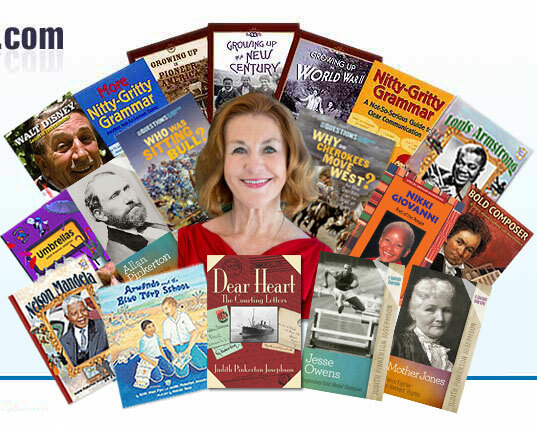 A former teacher, Judith Josephson has written stories, columns, and articles for children. Her award-winning biographies and history books include both nonfiction and fiction for children. Judith was interviewed on A & E Biography and Discovery television programs about her Allan Pinkerton biography. Her Jesse Owens biography was nominated for an NAACP Image Award. A chapter of her Mother Jones biography is included in an eighth grade reading text, and that biography was voted one of the Sixty Best Books of 1997 by School Library Journal. Our Armando and the Blue Tarp School was chosen by One Book, One San Diego 2012, as a companion book to Luis Urrea's Into the Beautiful North. Armando is about teacher David Lynch and his work educating the kids of the Tijuana dump. A children's musical based on the book raised thousands of dollars for David Lynch's foundation. The Greater San Diego Reading Association selected Edith Fine and Judith Josephson to receive the 2009 International Reading Association's Celebrate Literacy Award for their contributions to literacy, writing, teaching, and for their school visits. Their picture book for older readers, Armando and the Blue Tarp School was nominated for a 2009-2010 California Young Reader medal. Judith has received San Diego Book Awards for Umbrellas (a whimsical jaunt through the history of the umbrella), Growing up in World War Two (part of a childhood history series), Nitty-Gritty Grammar: A Not-So-Serious Guide to Clear Communication (illustrated with cartoons) (www.grammarpatrol.com), Armando and the Blue Tarp School, Nelson Mandela, Who Was Sitting Bull?, and Why Did Cherokees Move West?.